Here are some we have in the greenhouse waiting for some warmer weather. I forget what this plant is--we use it to treat burns--but I have so many pots that we plan to put a couple in the herb garden. These are pretty! I would suggest already outgrowing their pots and confines. It looks like chives, which could/should be divided. Is the one cilantro?parsley? other? If cilantro will be gone by June anyway, but put in partial shade. Is the big one by the aloe rosemary? If so, needs a much bigger and deeper pot (deep root), or in ground where it has good drainage. The one to treat burns is aloe vera. imafan26 wrote: The one to treat burns is aloe vera. I had mine outside last year. Initially, it sunburned terribly (there's an irony in there somewhere....) even though I put it where it only got about 2 hrs of sun. Put it in a shade under my elevated window box "bench" and it fared much better. Aloe vera is a succulent and once hardened off, it does well in full sun to partial shade. You would have to keep it as a pot plant in any area that has frost, but can be outside in summer. It produces offsets and can get quite large. 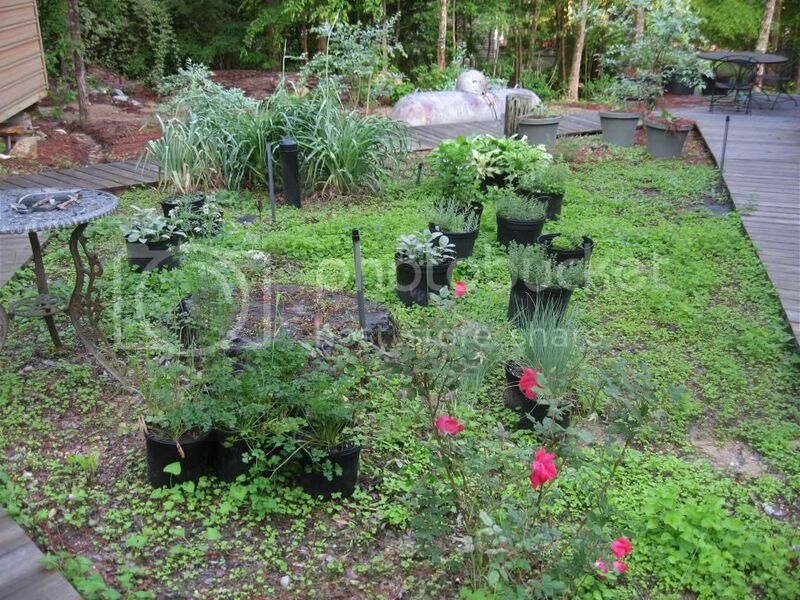 Older plants will bloom and have a very long lifespan. Mine are over 20 years old. Honestly, I'd keep the Aloe inside. It's such a low maintenance plant, and ends up needing more attention when it's outside in my experience. It's an easy plant, a good one to always have on hand. Since you have several, I think it'd be a good idea to try a few in the ground outside like you'd planned, but keep a couple inside while you see how the season goes. Then you'll be sure to have some happy aloe plants one way or another. I keep mine in the kitchen and it does great year round. I had a several cacti/succulents in the front yard (yeah, don't ask) and most have died from too much water simply from rain. Good idea about placing the herbs in the ground within containers, I've seen some posts on that and they just look so darn cool (although I've never tried it myself). Aloe does fine as a pot plant, it won't get as big. I just thinned mine again, the clumps can get pretty large. 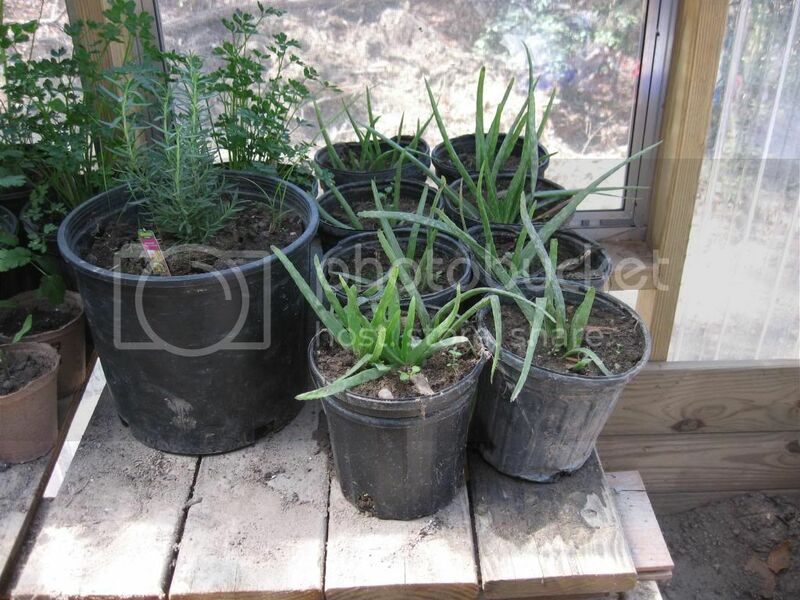 Aloe does not like a lot of water so if you are in a wet place you would probably have to plant it in a raised box of mostly gravel mixed with some dirt. 44 degrees on May 5, but sun is rising and herbs in Pots are happy this morning. You have plenty of room. Why don't you plant in the ground? Your rosemary needs more room and looking at the map it should be evergreen for you. Try planting half of your aloe in the ground. You should have a decent survival rate over winter. When planted in the ground they get very large and produce beautiful blooms. Keep a couple in pots just in case but do pot them up. Your chive will be fine in the ground. If you harvest the greens and leave the roots they will last for years. Dill is an annual so just plant it in the ground. Keep parsley and cilantro in pots so you can move them from the sun to part shade as the temps rise. Don't expect your cilantro to last past June. Re plant in the fall. Really a cool weather crop. I can usually coax my parsley along through July and even into August if I keep it cool and shaded during the heat of summer. I also have to make sure it is in a large enough pot for water retention but not sogginess. You have a nice bed. Plant some basil, sage, thyme and oregano in the ground. for years I grew my herbs in pots. Must have been a left over idea from my youth when I lived in apartments. In my old age potted herbs have become too much work. This spring I made a small herb bed. Instead of having to water every other day I have only watered twice. . My biggest problem is keeping my herbs from bolting. They are already wanting to flower so I pinch daily. Unless you have some reason for being set on growing your herbs in containers use that nice bed and plant them in the ground. Run some soaker hoses through the bed for ease of watering during the hot summer. 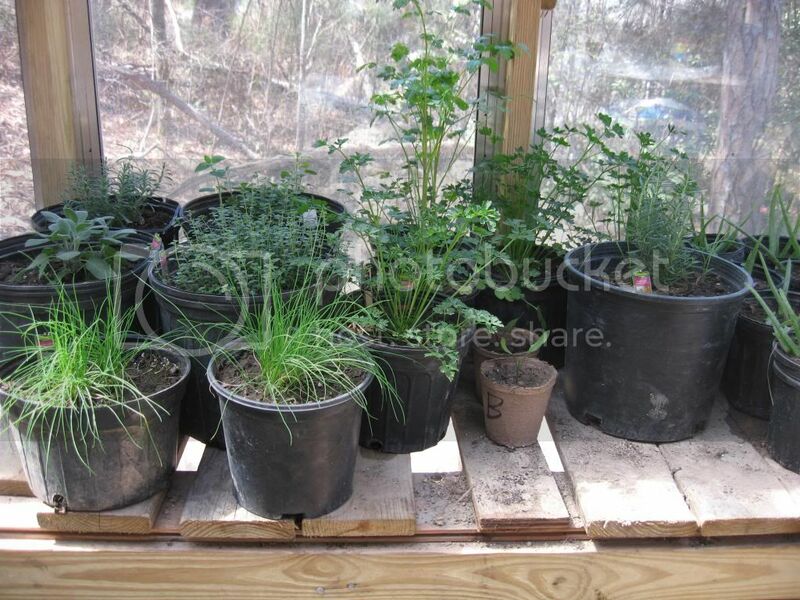 Really easier than containers especially since you are at the point of needing to pot your herbs up to bigger pots. Good luck and enjoy your herbs. The herb garden has irrigation. Those are the little stakes you see. Over the last two years we had the items in the ground, but could not control the weeds, and whatever that green ground cover is. This way I can just remove the pots, use the weedeater, and something stronger if desired, and put the pots back in.